It is a fact of common experience that a body in motion throught a fluid experiences a resultant force. In most cases, is mainly a resistence to the motion. In the case of an aerofoil the resultant force normal to the direction of motion is many times grater than the component resisting the motion. The possibility of the flight of the paraglider depends on the use of an aerofoil for the wing structure. The Joukowsky transformation converts a circle in an airfoil section. Explained here. - Chord: line joining the centres of curvature of the leading anf trailing edges. It can be shown that there is a point on the chord, for which the aerodynamic moment does not vary with the angle of incidence. dM/dalpha=0 This point is called the aerodynamic center AC and has been found experimentally and theoretically that is within a quarter of the chord from the edge. Cmo < 0 aerofoils will be called "unstable"
Cmo > 0 aerofoils will be called "stable"
Cmo < 0 aerofoils will be called "indiferent"
You may use the three types of Cm0 aerofoils in paragliding. 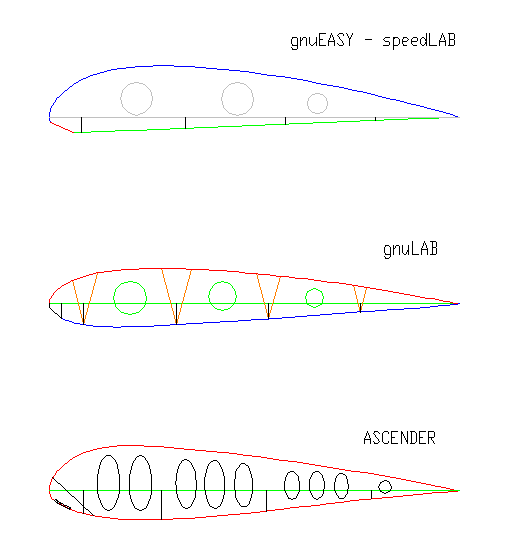 In general, the gliders with Cm0 <0 behave in a more lively and the easy to turn. While whith Cm> 0 we have a more stable wing, but difficult to turn (reflex airfoils). Depending on the use of the wing and its performances can be used either type. The trend is to use profiles Cm0 zero or slightly positive on the wings of competition to temper his natural aggressive behavior. But there is no fixed rule on this issue. The overall stability of the wing is controlled by the position of center of gravity. Should be discussed in another section. The NACA aerofoils can be generated by the use of a set of simple polynomial equations. The paraglider airfoils, despite being pressurized fabric, behave like the rest of the gliders. Position of air inlets: Must ensure the air entry inside the wing to keep the pressure inside slightly higher than outside pressure. Can be located by theoretical approaches, or even more frequent, by past experiences. Air intakes: 1% to 6% . Values in % of chord. Position of anchors: It has to do with the transmission of loads to the inflated structure. Usual place from 5 to 2 anchorage points along the chord. As normal in many years has been to use 4 anchors "A", "B", "C", "D". In more hight AR competition wings, may be used only 2 locations on the chord, in order to reduce drag. The position of these anchors must be determined experimentally and from previous experiences. The reduction of anchors may require the use of internal reinforcements to secure the transmission of loads over a wide area. Internal holes: The general rule is, to distribute the holes to allow free air circulation between cells, and at the same time maintaining structural strength of the rib. LE procedure to obtain the paraglider aerofoil of any wing. Method based on the grid ripstop fabric.